“Organized September 14, 1814; Re-Organized January 9, 1854. All of the dates mentioned above are important to the history of the General Society of the War of 1812. But they are misleading owing to compromises made in the creation of the modern Society in 1894. Following the conclusion of the War of 1812 in 1815, many of the war’s veterans formed organizations to commemorate their roles in this conflict – some of these honored individual volunteer militia companies; some were survivors of a particular battle or battles; others were organized along the lines of the Society of the Cincinnati which was originally composed of the officers of the Continental Army during the American War of Independence. No universal organization existed to coordinate the efforts of these groups or plead for the rights of the War of 1812 veterans in the halls of Congress. The date of 14 September 1814 commemorates the Battle of Fort McHenry when the surviving veterans vowed to re-unite to celebrate their victory. An Association of the Defenders of Baltimore in 1814 was comprised from the veterans of the militia units which participated in the Battles of North Point and Fort McHenry and defeated the British thrust to capture Baltimore. Those veterans gained the sobriquet “Defenders” from the local citizenry. On the first anniversary of their successful repulse of the British, the “Defenders” turned out from their work to witness the laying of the Battle Monument cornerstone. A large procession of veterans, mustered in their respective companies, paraded through the city. Ever after, Defenders’ Day has been observed in Maryland. Initially, Defenders’ Day celebrated the Battle of North Point on 12 September 1814 but later was moved to 14 September in honor of the defense of Ft. McHenry. In 1841, the Defenders met to establish a more formal organization which limited its membership to veterans and descendants of the collective Battle of Baltimore. The following year, a national encampment was held with veterans from Pennsylvania, Virginia, and the District of Columbia attending. President John Tyler reviewed the parading veterans. On the 14th of May 1842, the veterans received their first organizational charter in Maryland recorded in the Circuit Court of Baltimore as “The Association of Defenders of Baltimore” and had as their purpose the encouraging of love of country, commemoration of the war, defraying of funeral expenses of veterans who were impoverished, and the education of their children. By 1888, the ranks of the Defenders of Baltimore grew thin and the first non-veteran President elected that year. In 1893 – anticipating Cadwalader’s plans with the General Society—it was incorporated as The Society of the War of 1812 in Maryland of Baltimore City and membership enlarged to include descendants of all veterans of the War of 1812. In late 1850 an outraged Joel Barlow Sutherland (1792-1861) published an open letter in a local Philadelphia newspaper relating to recent Congressional legislation granting bounty lands to War of 1812 veterans without the permission to sell or assign the warrants to others. This proved a hardship as many of the veterans and their widows had no means to see the potential lands to be granted and the law required a warrant to be personally presented to be honored. Judge Sutherland, of the Court of Common Pleas of Philadelphia, and former 5-term member of the House of Representatives, expressed his desire to see veterans and widows of the War of 1812 receive the same benefits as Revolutionary War and Mexican War veterans, including the right to sell bounty land warrants and receive pensions for their service. Sutherland chaired a meeting of veterans in December 1852 in Philadelphia at the County Court House (now known as Congress Hall). Sutherland urged the creation of local and state War of 1812 veteran organizations. Following this meeting, veterans throughout the country held meetings and rallies in support of new bounty land legislation. In 1853, a call went out for a general meeting of all War of 1812 veterans to be held in Philadelphia on 8 January 1854, the anniversary of the Battle of New Orleans. As 8 January 1854 was a Sunday, the meeting occurred on Monday, 9 January. At least 600, and possibly as many as 1,500, veterans congregated in Philadelphia in January 1854. Judge Sutherland was elected president of the Convention which passed numerous resolutions relating to bounty land grants to the War of 1812 veterans and extension of the existing Pension Act for veterans of the American Revolution to cover War of 1812 soldiers and sailors. The convention formed an organization known as the Soldiers and Defenders of the War of 1812. Under this mantle, the society held annual meetings until 1886, usually around Independence Day. Membership was limited to military veterans of the War of 1812 and male descendants. The 1855 meeting was held in Washington, D.C. where the members were received by President Franklin Pierce at the White House. Sutherland’s goal of allowing War of 1812 veterans to sell bounty lands became reality in 1855 but not until 1871, ten years after his death, were pensions awarded to the veterans based upon their service. The members of the Society also looked for ways to help indigent fellow veterans and their widows. Sons and grandsons of veterans were invited to join the Society. The last veteran who served as President of the Society, John Stallman, died in November 1890 and it seemed as though the Society would pass with him. “Instituted in Joint Convention at Philadelphia, Pa., April 14, 1894” – Formation of the Modern General Society. This sparked interest in creating a military organization to allow descendants of the War of 1812 veterans who currently served in the armed forces to wear the insignia of an 1812 Society. A number of descendants thought that the organization should not perish and collaborated to ensure its revitalization and future growth. John Cadwalader (1843-1925), a noted Philadelphia attorney, retired Rear Admiral Francis Asbury Roe (1823-1901) and Surgeon General Charles Sutherland (1831-1895), son of Joel B. Sutherland, were among those who worked on a reorganized Society open to male descendants. On 8 January 1891, this Society elected Cadwalader as its first non-veteran President, a role that he served for 35 years until his death. It revised the constitution —adding the now famous Preamble – and was incorporated on 25 October 1892 in Philadelphia under Pennsylvania laws as the “General Society of the War of 1812.” Many notable United States military personnel joined the new General Society during 1891-1893. During this time, Cadwalader reached out to the few remaining organizations of War of 1812 veterans, including the “Association of the Defenders of Baltimore in 1814” and the “Military Society of the War of 1812” in New York, to unify with the General Society of the War of 1812. Both organizations had participated in the 1854 and 1855 national conventions. Cadwalader invited individual states to form state societies in 1893, not unlike the call made by Sutherland to the veterans in 1852. On 19 February 1894, at a meeting in Congress Hall in Philadelphia, where the first convention of veterans had occurred in 1854, Cadwalader presided over a joint meeting of the General Society and delegates from the Maryland and New York societies. A “Basis of Union” between the General and Maryland Societies was adopted which united the two societies under a new General Society (the Pennsylvania Society relinquished its claim to the name) and provided for the creation of new state societies. New York Society delegates attended this meeting but eventually declined to participate in a similar union. Delegates from the Societies in Pennsylvania, Maryland, Massachusetts and Connecticut met again on 14 April 1894 to formally adopt the revised Constitution of the General Society of the War of 1812. As part of the agreement with the Maryland Society, the date of the General Society’s organization is listed as 14 September 1814. 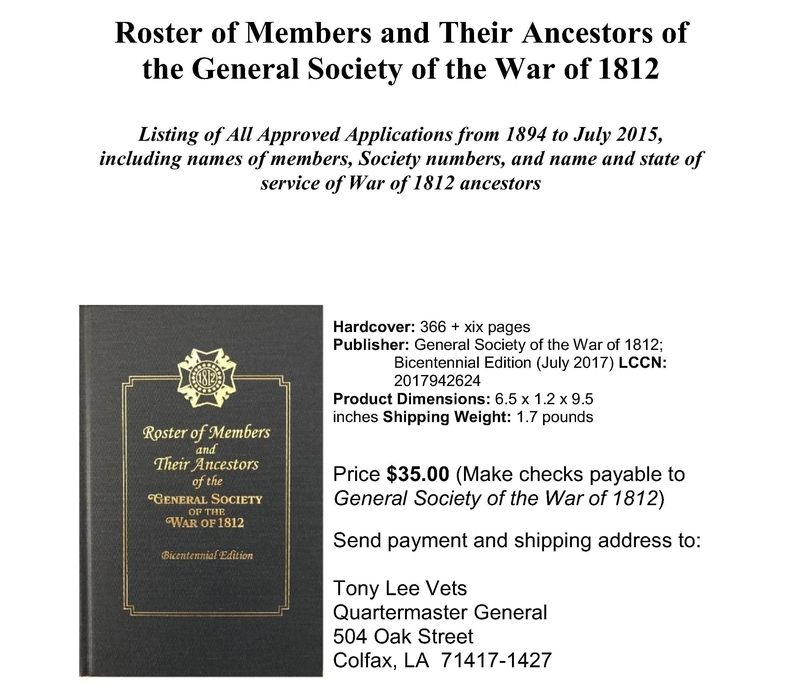 Since 1894, the General Society has chartered State Societies throughout the United States and remains the preeminent hereditary society for male descendants of veterans of the War of 1812. Founded by actual veterans of the War of 1812, the Society continues carrying out the goals set forth in the Preamble of its Constitution and fulfilling the visions of Joel Barlow Sutherland and John Cadwalader to honor those men who so bravely served in that war. On January 9, 1854 (a day after the anniversary of the Battle of New Orleans), a group of over 1,500 War of 1812 veterans from across the United States met in convention in Congress Hall in Philadelphia, having responded to a call issued by Joel Barlow Sutherland (1792-1861), an 1812 veteran and former Congressman from Philadelphia. Ostensibly called to draft resolutions pertaining to bounty land benefit legislation, the veterans assembled in Philadelphia acknowledged the need for an organization for mutual support and to perpetuate the history of the War of 1812. From this convention, the Society of the War of 1812 was founded and Sutherland was elected its first President. The Society met again in convention a year later in Washington, D.C., where they were received by President Franklin Pierce at the White House and lobbied members of Congress to secure the bounty land legislation, which was passed later in 1855. Sutherland’s goal was to form a division of the Society in each state in the union. Sutherland’s vision for the organization was not completed at the time of his death in 1861. Shortly thereafter, the Society began accepting sons and grandsons of Veteran members. On January 8, 1891, the Society elected John Cadwalader (1843-1925) of Philadelphia as its first non-veteran President. At a time when numerous hereditary societies were being formed, the youthful Cadwalader envisioned the Society of the War of 1812 as the premier men’s lineage society associated with the War of 1812. The Society’s constitution was revised—adding the now famous Preamble and restyling the organization as the General Society of the War of 1812—in 1892. Later that year, the Society was incorporated in Philadelphia. During this time, Cadwalader reached out to the few remaining organizations of War of 1812 veterans. One of those groups was the Defenders of Baltimore, whose association with the Society went back to the 1854 organizing meeting in Philadelphia where the Defenders were welcomed and seated en masse. The Defenders of Baltimore trace their origin to the huge collection of American militia companies that were called to meet the British thrust at Baltimore following the occupation of the National Capital. Those veterans gained the sobriquet “Defenders” from the local citizenry. On the first anniversary of their successful repulse of the British, the “Defenders” turned out from their work to witness the laying of the Battle Monument cornerstone and to view the Fort McHenry U.S. garrison and some of Maryland’s Fifth Regiment parade in the adjacent streets. Ever after, Defenders’ Day has been observed in Maryland. In 1841, the Defenders met to establish a more formal organization. The following year, a national encampment was held with veterans from Pennsylvania, Virginia, and the District of Columbia attending. President John Tyler reviewed the parading veterans. On the 14th of May 1842, the veterans received their first organizational charter in Maryland recorded in the Circuit Court of Baltimore as “The Association of Defenders of Baltimore” and had as their purpose the encouraging of love of country, commemoration of the war, defraying of funeral expenses of veterans who were impoverished, and the education of their children. By 1893, their ranks grew thin and the Defenders were reorganized to include the sons and male descendants of veterans. Later that year—anticipating Cadwalader’s plans with the General Society—it was incorporated in as The Society of the War of 1812 in Maryland of Baltimore City. In 1894, at a meeting in Congress Hall in Philadelphia, where the first convention of veterans had occurred in 1854, Cadwalader presided over a meeting which adopted the “Basis of Union,” uniting the Maryland Society with the General Society and providing for the creation of other state societies. As part of the agreement, the General Society adopted the founding date of the Defenders of Baltimore—September 14, 1814—as its founding date. John Cadwalader was elected President General of the newly united group and served in that capacity until his death in 1925. In time the General Society chartered State Societies throughout the United States and remains the preeminent hereditary society for male descendants of veterans of the War of 1812. Founded by actual veterans of the War of 1812, the Society continues carrying out the goals set forth in the Preamble of its Constitution and fulfilling the visions of Joel Sutherland and John Cadwalader to honor those men who so bravely served in that war.